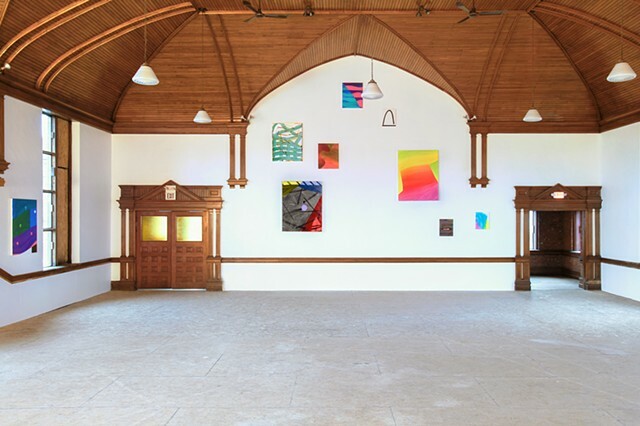 The Belfry in Hornell, NY, is a former church converted to an exhibition space. Terrazza is a reference to the terraced landscapes in the Tuscany region of Italy where I stayed for two months during the previous fall in an apartment overlooking the Chiana Valley. The landscape, horizon line, fluctuating atmosphere and light quality became a daily studied observation from the rooftop terrace. The simple act of slowing down and noting these subtle or abrupt shifts in a single space over a period of time is realized in this body of work. Some paintings appear to be self-contained while others freely expand beyond their borders forming new relationships with the works around them. I installed the paintings in a terraced formation on the largest wall of the gallery to open up this dialog and used bright transparent layers to suggest the luminosity of the stained glass windows once present in the original space. The installation of the paintings became a reflection of my painting process, allowing for new connections to be made between shapes, colors and gestures.